800CEORead Business Book Award in Management and Workplace Culture You CAN love your job again. It can feel like a rigged game. Executives set aggressive goals, so managers drive their teams to burnout trying to deliver. Or, employees seek connection and support, so managers focus on relationships . . . and fail to make the numbers. The fallout is stress, frustration, and disengagement, and not just among team members-two-thirds of managers report being disengaged. To succeed, managers cannot choose between results and relationships. They need both: They must get people to achieve while creating an environment that makes them truly want to. 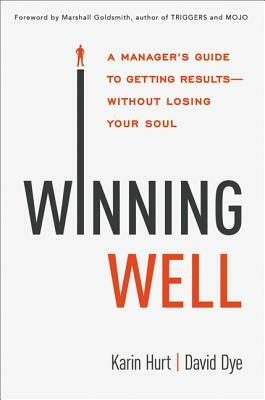 Winning Well offers managers a quick, practical action plan-complete with examples, stories, and online assessments. They will learn how to: Stamp out the corrosive win-at-all-costs mentality * Focus on the game, not just the score * Reinforce behaviors that produce results * Sustain energy and momentum * Correct poor performance without drama * Build productive relationships * Be the leader people want to work for Today's hypercompetitive economy has created tense, overextended workplaces. Keep it productive, rewarding, and even fun with this one-stop success kit. KARIN HURT is a top leadership consultant and CEO of Let's Grow Leaders. A former Verizon Wireless executive, she was named to Inc. Magazine's list of great leadership speakers. DAVID DYE is a former nonprofit executive, elected official, and President of Trailblaze, Inc., a leadership training and consulting firm.